Thing is that song has been going through my head today. Because although I love to cook, and I do try new recipes on a regular basis, there are some areas of cooking that are just no-go zones for me. I do not work with gelatine (not leaf, nor powdered). I do not make my own pastry (yep – shop bought here all the way people), and I do not work with yeast (for some reason it just scares me). There is no logical reason for these rules. And they are rules even though I cringe as I type it, because if a recipe has gelatine, no matter how good it looks I just won’t try it! And I most definitely do not download it or put it on my pinterest board, because it’s just not going to happen. These rules have existed for forever, and they are almost instinct, I don’t even notice them. Because a good friend of mine, (thanks K) told me how easy bread was to make. And I thought “ok, maybe”, and sat with it for about 2 months. And then I bought some yeast, because buying the ingredients and getting them in the pantry is an important first step. After another month I bought some strong flour. 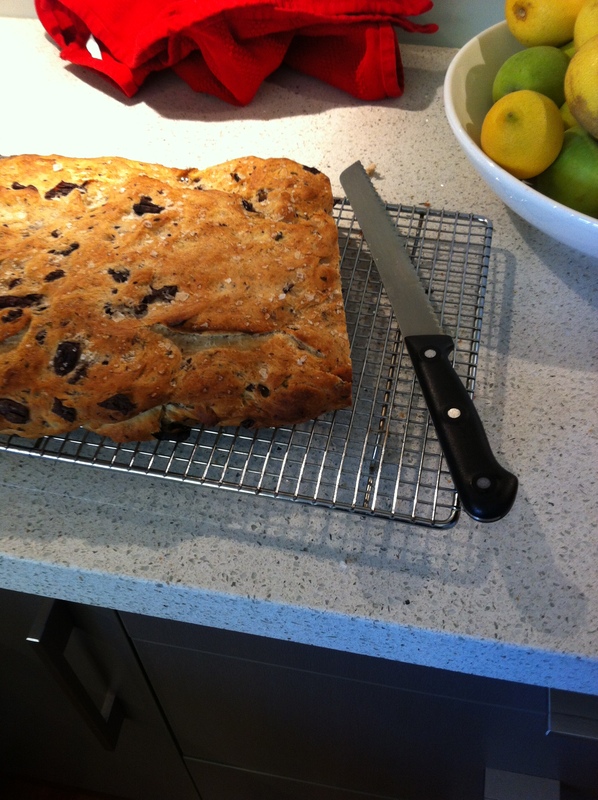 Yep, another month … and today I made my first bread, an Olive and Rosemary Focaccia. It was so tasty, it filled the house with the most amazing smells, it was actually really easy (just a lot of waiting around) and we have already eaten half of it. But the best part, is the sense of satisfaction from trying something new, making my own bread, eating it warm out of the oven, giving the kids “bread mummy made” for lunch. I think I will wear this smile all day. And I hear that song again, with my own alteration “you gotta try new things cause it might feel good” (and taste good too!). And it does … now to buy some gelatine! I love when mamas have ah-ha moments ourselves that we have been trying to teach our children!